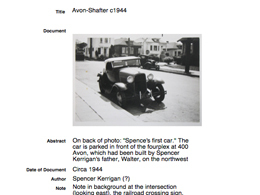 The Temescal Community Archive is an initiative to collect and catalog the approximately 2,000 historic photographs, maps, other two-dimensional documents, and oral interviews that former and current members of the Temescal community have contributed for use in Shared Ground projects. 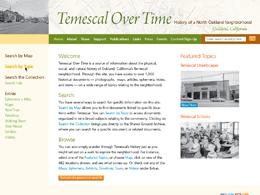 The Temescal Over Time website, now under development, will provide public access to hundreds of historic photographs, maps, newspaper articles, ephemera, video, and more, on a wide range of topics relating to Temescal and North Oakland. Temescal Over Time will also feature timelines, walking tours, a guide to researching the history of your house, and exhibits on special topics about Temescal. "Reading History" is an exhibit of photos, maps, documents, and a timeline that highlights changes at the Temescal Library and in North Oakland over the past nine decades. Jeff Norman and Martha Bergmann, former Temescal Branch Manager, worked together to produce the exhibit. 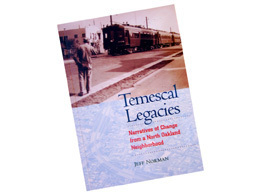 Temescal Legacies examines five historically significant changes to the Temescal district and surrounding neighborhoods of North Oakland, and the impacts these changes have had on the community. 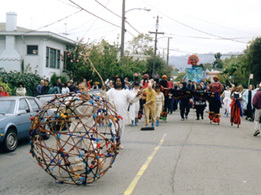 The book features interviews with long-time Oakland residents and includes over 200 previously unpublished photographs. "Faces of Temescal," a temporary installation, featured a 52-foot by 18-inch vinyl banner mounted on a chain link fence that fronted on Telegraph Ave. 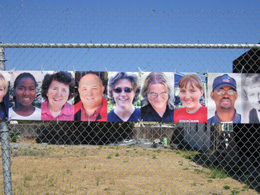 The banner, consisting of 42 portraits of Temescal residents, merchants, and students, was designed to reflect the diversity of the Temescal community. "You Are Here," a multi-component interpretive project that explores the idea of "place," consists of 1) a series of historical maps of the area mounted in the lobby of 4811 Telegraph Ave.; 2) a storefront window silk-screened with a reproduction of an 1895 photograph in tribute to Telegraph Avenue's long-standing role as a transit corridor; and 3) mounted outside the front entrance, an interpretive marker whose text and images describe the site's history. 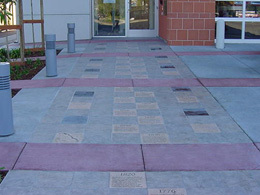 The "History Walk," a permanent public art project located in front of the recently rebuilt Station 8 Firehouse, is a public walkway consisting of alternating porcelain tiles etched with images and text that tell the interweaving story of Temescal's development as a community and Station 8's evolution since its formation in 1901. Copies of an accompanying color brochure, Timeline/Lifeline: A Story of Fire Station 8, are available free to the public. 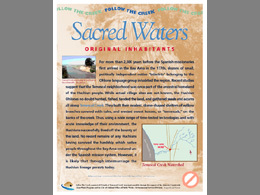 "Follow the Creek," a series of nine interpretive markers exploring the natural and social history of Temescal Creek, was mounted for a year on the chain-link fence that surrounded the vacant lot on the northeast corner of Temescal's busiest intersection, below which Temescal Creek passes unseen through an underground culvert. Students from California College of Arts and neighborhood children collaborated on the project. 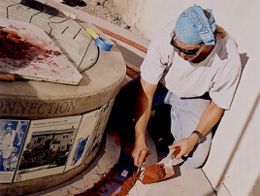 "PostMark Temescal" is a permanent, outdoor community gathering place and interpretive site whose unique benches and pavement surfaces feature multiple expressions of local history, portraits and quotes from neighbors, and a tribute to Temescal Creek (which flows in a culvert beneath the site). Native plants are used in the surrounding landscaping. Gathering input through workshops with local residents and students, and working with dozens of volunteers during construction, the artist team of Bruce Douglas, Sue Mark, Jeff Norman, and Remi Rubel designed, coordinated, and raised funds for the project. 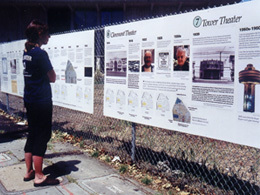 "Beyond the Pussycat," a multifaceted, community art project that drew upon the skills and expertise of dozens of neighbors, included: a six-month, on-site exhibit exploring the history of the vacant lot at 51st and Telegraph; a Temescal history slide presentation at Carter Middle School by Jennifer Dowling and Ray Raineri; and a one-day public event featuring local musicians, food from neighborhood restaurants, facilitated "community conversations" with neighbors about potential future uses of the site, and an outdoor film screening. The opening of this two-year exhibit on the natural and cultural history of the Temescal neighborhood coincided with the Temescal Branch Library's 80th anniversary and the gala opening of its newly retrofitted, historic landmark building. 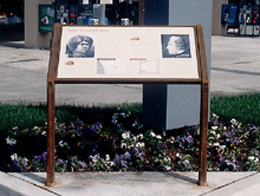 A permanent interpretive marker describing the neighborhood's early inhabitants, "Some Local History" is located on what had been the site of Vicente Peralta's adobes. The Temescal History Project, a multi-component, all volunteer, community art project, included: Where We Live, an exhibit on Temescal history mounted for six months in storefront windows on the east side of the 5000 block of Telegraph Ave.; Where We Live: Stories from Temescal, a 45-minute video featuring recollections of long-time Temescal residents and merchants; the book, Temescal Album: History of a Neighborhood, which provides a basic introduction to Temescal's history; a self-guided walking tour booklet, A Walk Through Temescal (co-published with the Oakland Heritage Alliance); Temescal Opening, a one-day event that included performances, music, and a walking tour through the neighborhood; and Local History at Emerson, a ten-week local history program for third-graders at Emerson Elementary School. name to our announcement list.